The National Archives of Azerbaijan was established by a decree in 1920 by Nariman Narimanov (1870-1925), who was one of the leading personalities who helped usher the Bolsheviks into power in Azerbaijan earlier that year. In December 2005, the National Archives celebrated its 85th Jubilee. Though many of the documents from this turbulent period when Bolsheviks took control of Baku  have been lost, there are others which have enabled historians to slowly piece together the events that shaped those early years of Soviet Azerbaijan. Atakhan Pashayev is one person who knows the archives extremely well, having spent his entire professional career working there since 1962. Despite the fact that Narimanov was instrumental in getting the Soviet government set up in Azerbaijan, Pashayev is convinced that Narimanov genuinely had Azerbaijan's interests at heart. He also is convinced that Narimanov's mysterious death was not simply a heart attack but part of Stalin's plan to remove Nariman from his position in Azerbaijan because he had directly contradicted Stalin's policy and spoken openly about it. Nariman, according to Pashayev, is one of the first in a long-line of Bolshevik and Soviet leaders to disappear from the scene when he was no longer useful to the system. 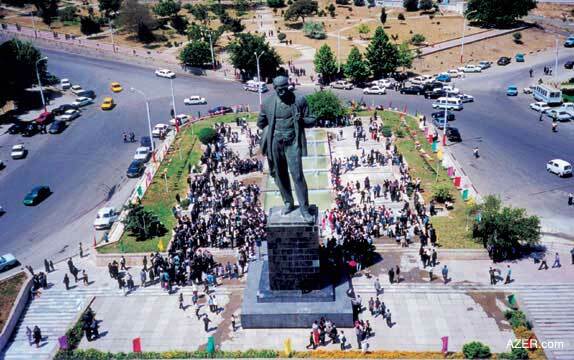 Above: The Narimanov statue in Baku was organized for the occasion of Nariman Narimanov's 100th Jubilee (1970). The statue was erected a few years later upon the insistence of Heydar Aliyev, First Secretary of the Central Committee of the Azerbaijani Communist Party. Narimanov's statue is one of few which has not been pulled down after the collapse of the Soviet Union since he was a leader involved in the early Bolshevik movement in Azerbaijan (1920). Though Narimanov is a controversial figure, some historians claim he really did have Azerbaijan's best interests at heart. Photo: Khanlou. I've come to the conclusion from my extensive research in Azerbaijan's National Archives that Nariman Narimanov really loved his people and his nation very much. He was among those who helped to establish the Hummat Party back at the beginning of the 20th century. Hummat was a branch of the Russian Social Democratic Party that was established by Muslims in Azerbaijan. But after the 1917 October Revolution, the Bolsheviks issued a decree concerning the rights of nations to determine their own fate. Accordingly, any nation within the region of the territory ruled by the former Czar of Russia could separate any time and form its own national state. After this decree, Narimanov got more involved with the Bolsheviks. At that time, the Soviet government had already been formed in Russia, although it had not yet been organized in the Caucasus. Above: Painting of Nariman Narimanov in 1970 by Azerbaijani artist Ogtay Sadigzade, who was imprisoned in labor camps in Central Asia for five years. Ogtay was charged with being the son of an "Enemy of the People". His father, a writer and intellectual, was falsely accused and then arrested and executed. This painting is entitled: "The 1920s". 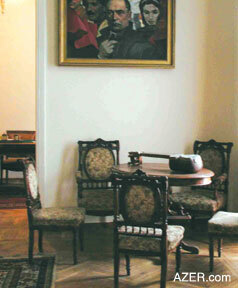 It hangs in the Home Museum of Nariman Narimanov in Baku. Photo: Art by Ogtay Sadigzade. Corner: Statue of Narimanov. Photo: Blair. Naturally, what interested Lenin the most was Baku's oil. He didn't want to lose the fields that had been developed during the Czar's period. Armenians were very active in this work. Stepan Shaumyan had established close relations with Lenin. At the beginning of 1918, Lenin appointed Shaumyan as Extraordinary Commissar to the Caucasus. Shaumyan went to Tbilisi, as this was the center of the former Caucasus Province. However, he soon was forced to leave, and since Baku was one of the cities where democratic movements and revolts were quite prevalent, Shaumyan came here. Lenin's followers welcomed him. In March 1918, the People's Commissariat in Baku was established and Shaumyan was appointed as its Chairman. At that time Russia, England and France together were fighting against Germany, Austria, Hungary and Turkey. The Caucasus front had been opened from Eastern Anatolia, and Armenians comprised the majority of soldiers fighting there on behalf of the Russians. After the Bolshevik Revolution in Russia (1917), Russia gradually pulled out of the war, and the soldiers who had been defending the Caucasus started to return home. At that time, the Armenian soldiers held onto their guns and, in fact, bought additional guns from the Russian soldiers as well. The Russian soldiers had to pass through Baku en route back home, and Armenians frightened them by saying that Muslims were barbarians and that they might get killed in Baku. It was for this reason that authorities in Baku were demanding that the Russian soldiers be disarmed while passing through Baku. But Shaumyan did not allow this to happen. Instead, he further armed the Armenian Dashnaks. Narimanov was the Commissar of Communal Economy at that time . So talks were carried out between the Musavat party (Azerbaijanis who wanted to rid themselves of rule of the czar) and the Dashnak party (an Armenian revolutionary group). Despite these talks, Shaumyan did not allow disarmament to take place. A great tragedy followed when Armenians and Russians organized a massacre in Baku on March 18-21, 1918. Those days were deliberately chosen because this is usually the most joyous and happy holiday of the year - Novruz [Rite of Spring]. Some sources say that about 10,000 people were killed, while others suggest the figure to be as high as 15,000. This slaughter in the streets lasted three days - March 18-21 by the old calendar (or March 30-April 1 by the new calendar). During this massacre, they burned down the most ornate example of Oil Baron architecture in the entire city - Musa Naghiyev's palatial mansion, which he had dedicated to the memory of his son Ismayil and which was being used to house the Philanthropic Society. Today this building on Istiglaliyyat Street serves as the Presidium of the Academy of Sciences. Nearby stood the editorial office of Kaspi newspaper. They burned them as well. They also did severe damage to the Taza Pir mosque and to the Metropol Hotel, which has since been converted into the Nizami Literature Museum. It's interesting to note that about 70-80 percent of the people working at the People's Commissariat in 1918 in Azerbaijan were Armenians. Nariman Narimanov, Mashadi Azizbeyov and Heydar Vazirov were the only Azerbaijanis in this group. On May 28, 1918, the Azerbaijan government was first established in Tbilisi [Georgia]. On June 16, they moved to the city of Ganja [Azerbaijan]. Lenin sent military support to Shaumyan, which supported their attack against Ganja in the north central region of Azerbaijan. The army succeeded in moving up into the regions of Goychay and even Kurdamir. On June 4, 1918, Mammad Amin Rasulzade and Mammad Hasan Hajinski signed a contract with Turkey on behalf of the Azerbaijan Democratic Republic [ADR]. Hajinski was serving as the Minister of Foreign Affairs at the time. One of the major agreements of that treaty was that the Ottoman Empire (in other words, Turkey), could provide military assistance if Azerbaijan needed it. Already by the second half of June, Turkish troops had passed through the Gazakh region (in northern Azerbaijan) and had entered Ganja. Volunteers in Azerbaijan along with a brigade of officers previously serving in the Czar's army, joined the Turkish troops, and together they succeeded to push back the troops of the People's Commissariat. At this time a major argument broke out between Narimanov and Shaumyan. Viewpoints differ as to what actually happened. The result was that Narimanov had a stroke and was sent to Astrakhan [Russia] for treatment. Narimanov was about 50 years old at the time. The Tatars [a Turkic group living along the Volga River] considered him their leader and held him in high regard. He was greatly respected among the Muslims. At that time Lenin was wondering who to appoint to establish relations with the Eastern nations, such as Iran and Afghanistan. That's when he chose Narimanov. At that time, Stalin was the Commissar on National Issues. Narimanov was called to St. Petersburg and appointed as the Chair of the Eastern Division. That's when they started to use him to undermine the activities of the independent-minded ADR government. He sent open letters to Nasib Bey Nasibbeyli, who was the Chairman of ADR government. They are all available and have been published. 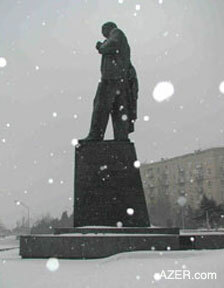 Left: Narimanov's Statue in recent snow storm in January 2006. Photo: Elman Gurbanov. The Bolsheviks actively used Narimanov, as well as others in Azerbaijan in their efforts to overthrow the fledgling independence movement in Azerbaijan (May 1918 to April 1920). After succeeding, they appointed Narimanov as the Chair of the Committee of People's Commissariat. He would return to Azerbaijan as the Chairman of Revolution Committee. When Narimanov met with Lenin to discuss these issues, he explained that when they would establish a new government in Azerbaijan, it should consist of only Azerbaijanis so that the people would trust them. That's why 80-90 percent of the leaders of the Azerbaijan Revolution Committee of the People's Commissariat consisted of Azerbaijanis when Narimanov returned to Azerbaijan to set up the Soviet government here. But Lenin was very shrewd. He wanted control over Azerbaijan. The documents indicate that Commissar Tamashevski and Secretary Gabridze had both signed this document. They were the ones who, in fact, were overseeing all developments in Azerbaijan. When Lenin established the Communist Party, he based its policy on international principles, not national ones. In February 1920, the Baku Bolsheviks, the Adalat Party and the Ahrar Party of Iran joined together to establish the Azerbaijan Communist Party. Lenin sent Kalinsky to be Secretary of the Party, and then in 1922, assigned the position to Kirov. These individuals had strict oversight over the Committee of People's Commissars. 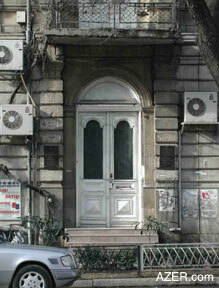 Above (Left): Entrance doorway to the Narimanov Home Museum at 30 Istiglaliyyat Street. 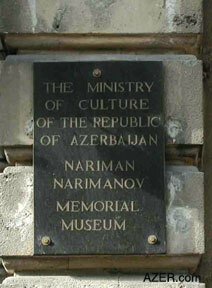 The museum is on the second floor and if they were given power, they would kill all non-Azerbaijanis. Right: Plaque at the street level of Narimanov Home Museum in English. The plaque on the left hand side of the entrance is in Azeri. Photos: Narimanov Museum-Ulviyya Mammadova. On April 27, 1920, eleven days after the establishment of the Soviet government, Lenin appointed Serebrovsky to Azneft [the major oil-producing company]. 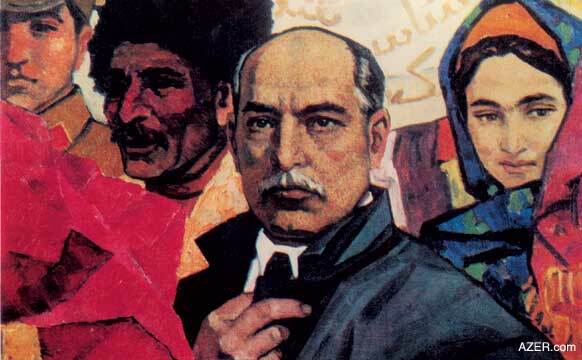 Lenin congratulated Azerbaijan on the formation of an independent Azerbaijan Soviet Socialist Republic; however, the documents signed by Lenin and Stalin gave Serebrovsky complete authority over the oil industry in Azerbaijan and demanded that everybody - both military and civilians - follow Serebrovsky's command. During those 23 months when the independent Azerbaijan functioned [May 1918 to April 1920], Azerbaijan experienced so many difficulties. After Thomson arrived in Baku on November 17, 1918, long discussions were carried out with Fatali Khan Khoyski (1878-1920) who served as the first Prime Minister of the Azerbaijan Democratic Republic. Thomson insisted that the government consist of people from various nationalities - Azerbaijanis as well as others. When they discussed these issues in the Azerbaijan National Council, they didn't even take time for translations. For example, sometimes the documents were written in Russian, but the meetings were held in Azeri. The negotiations between Thomson and the ADR lasted from November 17 until December 9. Finally, Thomson agreed to the establishment of the Azerbaijan Parliament. Actually, the Party was more important than the government itself. Every decision made by the Party had to be fulfilled immediately by the government. That's why Narimanov realized that he had been deceived. In reality, it was Kirov and Serebrovsky who were leading the government. When Serebrovsky wrote a letter to Nariman Narimanov, he would copy the same letter to Kirov so that he could oversee Narimanov's activities. Despite the fact that Armenians had killed so many Azerbaijanis while the ADR was in power in 1918-1920, Kirov was able to establish an Armenian mafia here, which included the likes of Mirzoyan, Mikoyan, Sarkis and others. In turn, these figures started to pull Narimanov into a trap. They were the ones who reached the agreement with Lenin about giving less than 10 percent of the oil to Azerbaijan while making sure that the rest was sent to Russia. 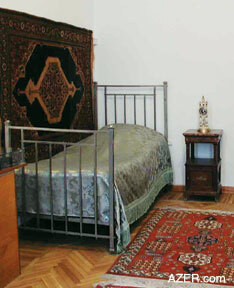 Above (Left): Narimanov's bedroom on display in the museum. Right: Living room of the museum. Note Narimanov's tar on the table. Photos: Narimanov Museum - Ulviyya Mammadova. We have documents from Azneft. There were so many arguments about this issue. At the 21st Congress, Azerbaijanis were questioning how it could be that oil, which was being produced in Azerbaijan was cheaper to buy in Georgia and Armenia than in Azerbaijan. By December 1922 when the Soviet authority was well established in Azerbaijan, their primary goal was to gain control over everything and then to remove Narimanov. There were four chairmen of the USSR Central Executive Committee. They represented the Caucasus, Russia, Ukraine and Belorussia [Belarus]. Each was supposed to lead the Committee in turn. Narimanov was one of these chairmen, but he understood the trap that they had set for him, especially after the death of Lenin. He wrote an Open Letter to Stalin and the Central Committee about their national policy in provinces. Narimanov wrote that, unfortunately, Stalin didn't believe us Muslims and had given the power to the Orjonokidzes, Mirzoyans and Mikoyans. I'm mentioning these facts because it explains the reason of Narimanov's death. There was always a method to Stalin's approach. It was not just Narimanov that he killed by this method. He later also killed Orjonikidze, Kirov and others the same way. He would organize the deaths of such people, either by suicide or by some other way that appeared very natural, and then after their death, he would organize solemn funerals in their honor. The general public, then, would not be suspicious of any foul play. Nobody seems to know exactly how Stalin organized Narimanov's death. In the memoir of one of his relatives, it says that he came home one day, had some food and then left. About an hour, or an hour and a half later, the family was notified that Narimanov had passed away. They say that a cleaning person noticed that he was feeling bad and notified someone and they took him away. Narimanov was one of the first of Stalin's victims, and one of the first to be buried at the Kremlin. His gravestone is still there behind the Lenin Mausoleum where they used to bury the most famous personalities. Kirov and Orjanikidze are also buried there. After Narimanov died, the government announced a three-day period of mourning. Hundreds of thousands of people participated in his funeral - just as if he had died naturally. Narimanov was only 55 years old at the time. People hold different opinions about Narimanov. Some people, especially members of the National Front, which came to power in Azerbaijan at the beginning of 1990s, denounce him as an "Enemy of the People". For example, Narimanov insisted that Azerbaijan's happiness was connected with Russia. That is inscribed on Narimanov's statue. The National Front criticized him for everything. Some people considered him to be a Nationalist, but that isn't right either. Simply, Narimanov loved his nation. 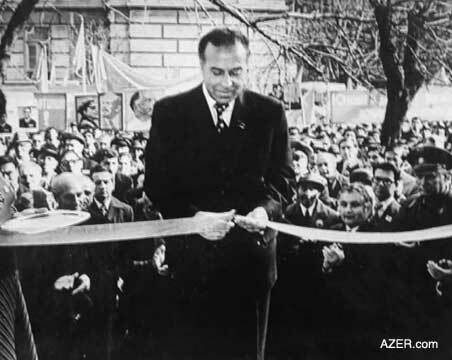 Above: Heydar Aliyev, as First Secretary of the Central Committee of the Azerbaijani Communist Party, was instrumental at the opening ceremony of the Narimanov Memorial Home Museum in 1977. Photo: National archives of Azerbaijan. Both Georgians and Armenians wrote many things against Narimanov. Heydar Aliyev issued a decree to celebrate his 100th Jubilee  and to erect a statue in his memory. The statue was designed so that it could be seen from all parts of the city, just as Kirov's monument, which overlooked Baku from the highest vantage point. But Levon Shaumyan, son of Stepan Shaumyan, who was the Editor of the Soviet Encyclopedia at that time, offered extreme resistance to the idea. Because of the ensuing arguments about the statue, Narimanov's Jubilee was delayed for more than two years. His 100th jubilee was actually celebrated in 1970, but the statue was not erected until 1973 or 1974 and only because of the strong will of Heydar Aliyev. However, those who opposed the idea succeeded in having the pedestal designed lower than originally planned. Usually the pedestal is at least twice as high as the statue itself. Narimanov's stand is much shorter. However, unlike all the other leaders of the Bolshevik movement - Stalin, Kirov, and even Lenin, the statue of Narimanov still stands. It has not been dismantled as were others, especially after the Soviet Union collapsed in late 1991. Atakhan Pashayev is Director of the National Archives of Azerbaijan, which just celebrated its 85th Jubilee in December 2005. He has been working there since 1962 and has held the position of Director since 1984.